So, I contacted WARN today to see if I could find the replacement decals for my well used HS9500i. They turned me over to Winch Service Parts (www.winchserviceparts.com). Jack was very helpful and had everything I needed. 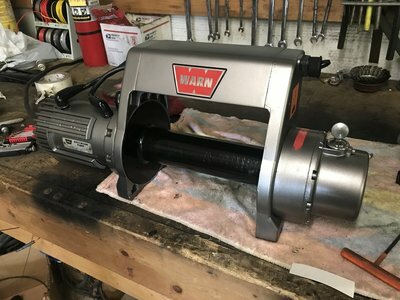 They also have an exploded diagram of all WARN models on the site so you could always search for the best price if you felt the need. Not going to claim they were cheap, for all of the decals it was around $65 to the door. I ended up getting the drum end support and the boots for the terminals since I was already paying $12 shipping. My drum support had a crack i've been trying to repair and was just not sure it was going to look real good. And, if i'm going to spend $65 to make it look good, it needs to look real good. Thought this info may be of good use to someone down the road. I need to get the diagram and check out the brake assembly for my 9500ti. When I was rebuilding my 8274 Clemson 4 wheel had a good many rebuild parts in stock also. May be worth checking. Yeah, Cole just hurt my feelings. They had everything I needed. A LOT cheaper. for sure, thanks for the info! Well, couldn't cancel the order. They shipped it yesterday....so I guess thats good and bad. Either way, winch will look great now.